The firing range at Cu Chi. We're not fans. 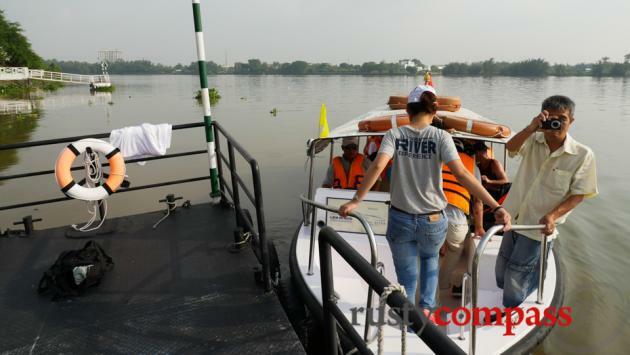 A boat trip along the Saigon River is a great way to visit to Cu Chi. 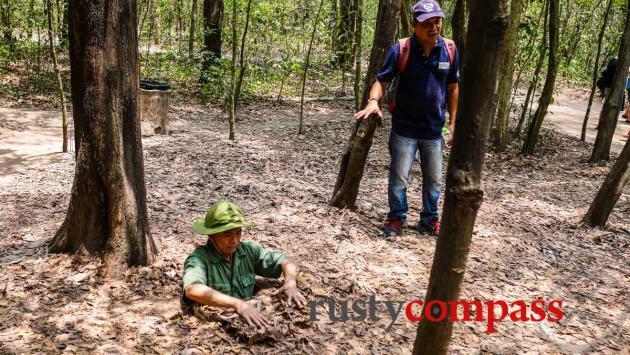 The Viet Cong tunnel network at Cu Chi, 70kms from Saigon, was an important base in the communist guerilla campaign against US and South Vietnamese forces. Despite the Disneyesque presentation, it's a worthwhile half day. 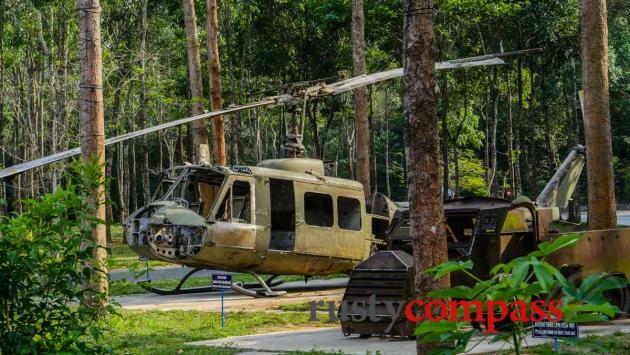 There are two Cu Chi tunnel complexes. We think Ben Duoc (slightly further away) has a more authentic feel. 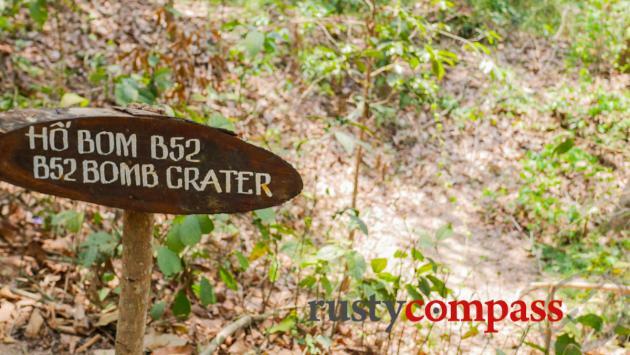 The 200 kilometres of tunnels at Cu Chi are the stuff of Viet Cong legend. 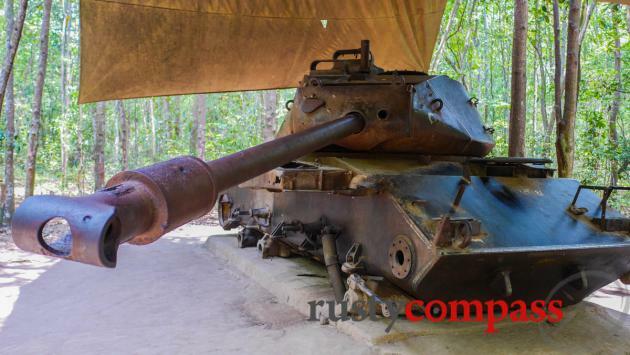 Initially built by Viet Minh guerillas fighting the French after World War II, they assumed a central role in the wider conflict against the US backed South Vietnamese government in the 1960s and 70s. The tunnels provided protection from superior French and then American weaponry, and an important offensive asset on Saigon's doorstep. At its peak, the Cu Chi network included sleeping quarters, kitchens, meeting rooms and hospitals serving more than 18,000 fighters. The Tet Offensive attacks on Saigon in 1968 were partially planned from the tunnels. The Cu Chi district was a major thorn in the side of South Vietnamese and US forces. 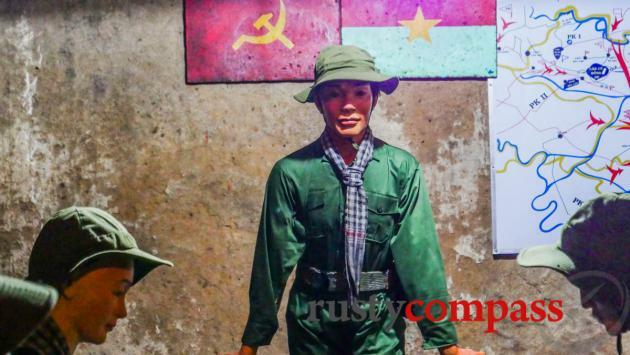 It formed a part of the infamous Iron Triangle of Viet Cong insurgency. The countryside around the tunnels was defoliated and carpet bombed. Massive bomb craters are still visible around the tunnel complex. 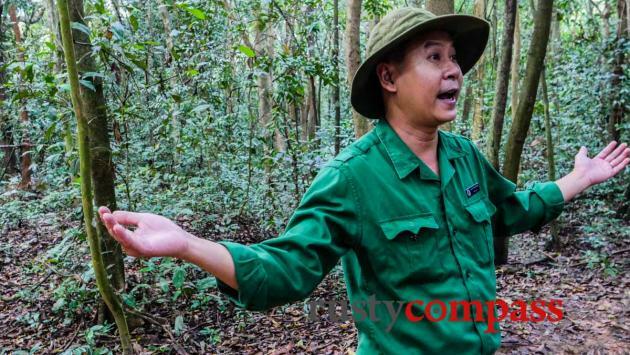 Two sections of tunnels have been opened for tourists - Ben Dinh and Ben Duoc. Ben Duoc is slightly further from Saigon and less crowded. It has a more authentic feel and is close by a large memorial and a Viet Cong cemetery. Ben Dinh is about 90 minutes drive from Saigon and Ben Duoc is another 15 minutes on. Don't miss the propaganda video at Ben Duoc - it hasn't changed since the 1970s. Travellers can climb through the tunnels and various chambers getting a sense of what a claustrophobic existence it must have been. And this is even after the tunnels have been widened to accommodate the Western girth. 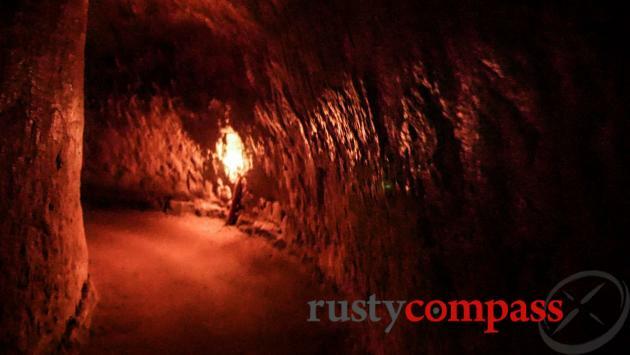 Guides at the tunnels are usually good though they have been known to cause both amusement and embarrassment blithely declaring some travellers "too fat" to enter. Vietnamese tend to be less sensitive about weight than Westerners. The atmosphere at the tunnels resembles that of a bizarre war based theme park - especially at Ben Dinh. Despite the fun park feel, which includes a rifle range where tourists can fire off M16 and AK47 rounds, the tunnels are an amazing testament to the David and Goliath struggle waged by communist fighters and are well worth visiting. 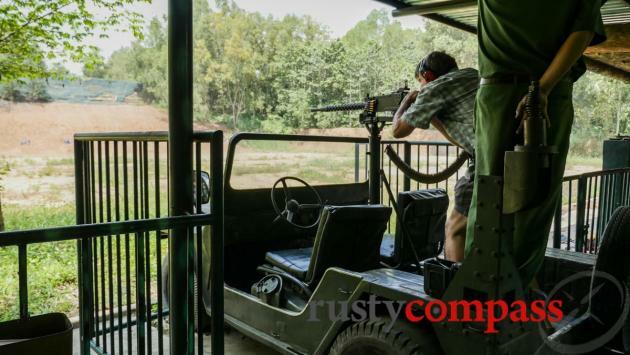 You can read our blog here arguing that the shooting range is inappropriate at Cu Chi. It’s a tough call though as it seems to have become a major cash cow. 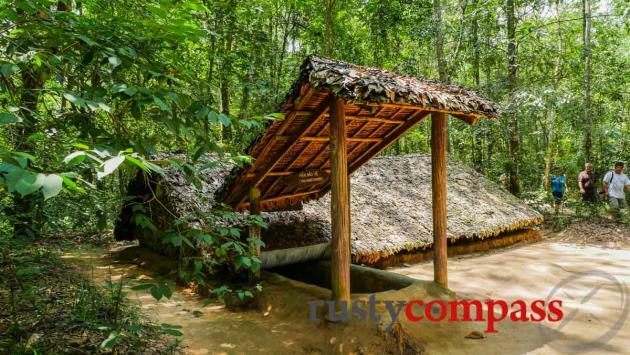 Our sister travel company - Old Compass Travel, now operates a tour to Cu Chi that's an alternate look at the tunnels, taking history and the solemnity of the place more seriously. 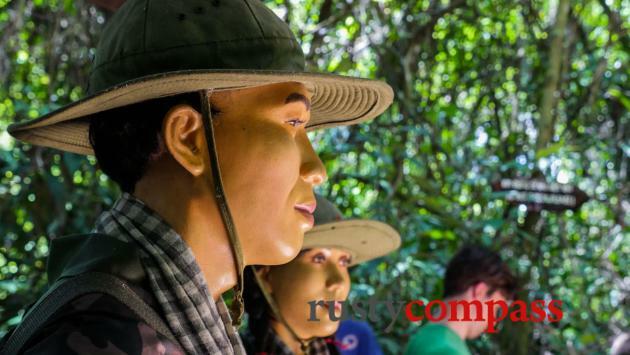 You can check out our alternative tour of Cu Chi here. 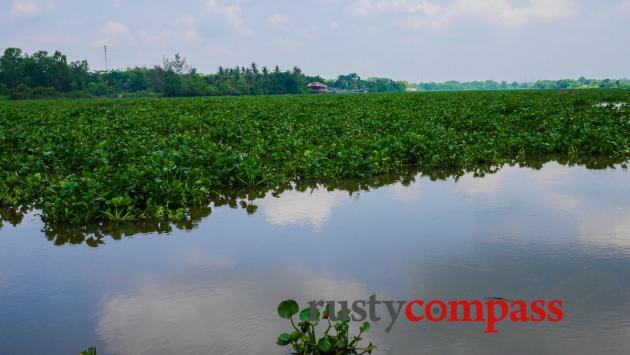 It’s worth considering travelling to Cu Chi (weather permitting), by boat. Three companies (listed below) offer daily tours by boat from around $80USD. The boat tours run to Ben Dinh on small speed boats - around 12 passengers. The boat journey takes under 2 hours (each way) and is an interesting experience of the river. If there are enough of you to charter a boat, go the extra distance to Ben Duoc. 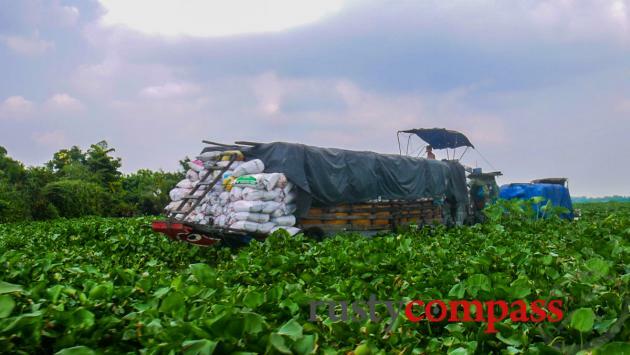 Companies operating boats to Cu Chi are listed below. We have travelled with both Saigon River Tour and Les Rives (Disclosure: We were guests on both occasions and did not pay). 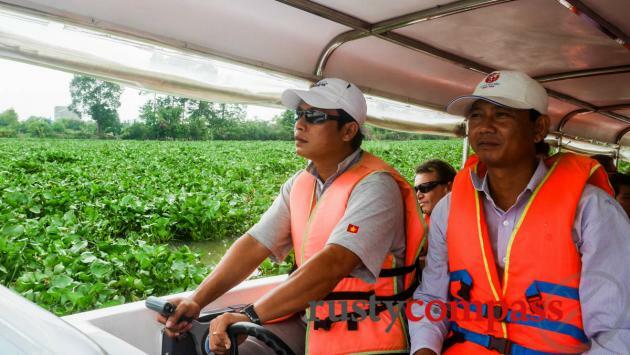 Saigontourist, Saigon’s big State tour operator also launched boat tours to Cu Chi in 2017. A visit to Cu Chi can be extended to a full day by including the Cao Dai Temple at Tay Ninh. It's a long day with lots of driving including some scenic rural countryside. See our "Cao Dai" entry for more information. View Video - Cu Chi tunnels audio grabs from old propaganda video.